Our interview series celebrating 100 years of the National Park Service in the United States and the important role soil plays in these parks continues. We travel back in time, 34 million years ago, to Florissant National Monument to learn about some of the most well preserved insect and plant fossils. NRCS Soil Survey Leader Laura Craven walks us through the mudstones, shales and volcanic deposits of this geologically rich formation. Laura Craven graduated from the University of Illinois in 1983. She has mapped soils for 8 initial Soil Surveys in Illinois, Virginia, and Colorado. Laura has worked on several details, including Natural Resources Inventory and wildfire restoration projects. She enjoys working with students on their soils projects and helping students prepare for FFA and Envirothon contests. Currently she is the MLRA Project Leader in Pueblo , Colorado. What is Unique About the Soils of Florissant Fossil Beds National Monument? In this park, beneath the ground, is one of the richest and most diverse fossil deposits in the world. Up to 1700 different species have been described. A majority of those fossils are fragile, detailed compression and impression fossils of insects and plants. The largest fossils are massive, petrified Sequoia trees. These are some of the largest diameter petrified trees in the world. The soils here formed in volcanic tuff and shale, the parent material that was deposited millions of years ago during the increased volcanic activity that happened when the fossils formed. Lymaning and Florissant are the soil series that are mapped here. Lymaning is moderately deep to shale and Florissant is shallow to shale. These soils are only found in this area. This area receives about 14 to 16 inches of precipitation each year. The soil temperature regime is cryic. Platdon is another soil mapped in this area. It is a very poorly drained soil on floodplains. If you are looking for a diverse look into the past, Florissant Fossil Beds is the place to find it. Unlike many other parks in the Southwest where fossils have been found, this park is lush with green scenery and panaramic views of the mountains. Along with the unique scenery, the soils also have their own unique makeup, molded by the billions of years of Earth's history in the Colorado area. It will be impossible to keep track of time exploring the granite deposits dating back as far as 1.4 billion years ago, remnants from volcanic eruptions and of course the fossil beds with a plethora of soil variations. What Do the Soil Colors at Florissant Fossil Beds National Monument Tell Us? Both Lymaning and Florissant soils have a mollic epipedon. The surface colors are 10YR 3/3 or 10YR 3/2. These soils are formed under grass vegetation and the dark surface color is from the high organic matter from the plant roots. Platdon also formed under grass vegetation and has a thicker dark surface horizon from high organic matter, 10YR 2/1. Platdon has gray colors, 10YR 5/1, in the C horizon from the high water table and lack of oxygen. Platdon also has 7.5YR 4/6 masses of oxidized iron and 10YR 6/2 iron depletions in the C horizon due to the fluctuating water table. 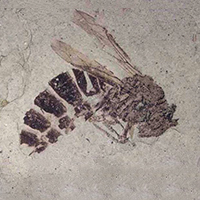 A majority of those fossils are fragile, detailed compression and impression fossils of insects and plants.